Ran Slavin (1967) is a Tel Aviv based film maker, video artist and sound producer. His cinematic frameworks oscillate between dream like narratives and neo-noir. Recognizing video as a tool of observation, Slavin explores this illusionary and post natural medium by creating magical sites, where supernatural and mythical elements interfere and the imaginary interacts with the contemporary. Fashion designer and dancer, enfant terrible Romain Brau presents people from fashion, dance, nightlive in a very over the top set up. 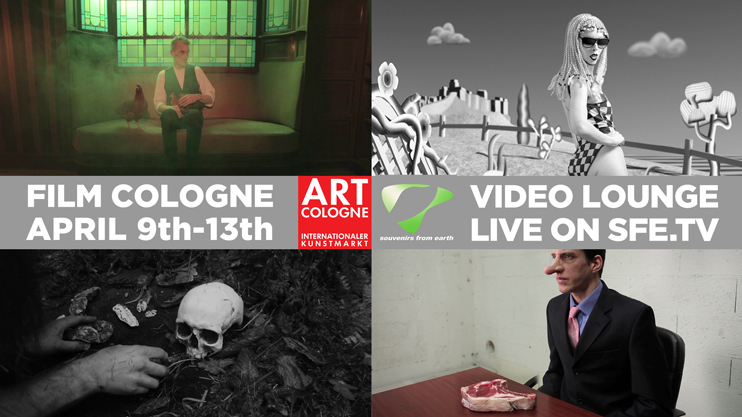 Paris artist collective Dimanche Rouge screens latest performance art from around the globe. The Marseille art school ESADMM presents latest student works and archives ranging from video clips, performance art to animation and photo films. The first ever regular TV show for an art school. We broadcast the talkshow/lunch/perfomance of the hors pistes festival produced by the Cnetre Pompidou. Bill Viola / Tom Sachs / Kolkoz / Jordan Wolfson / Julian Opie and a selection by Chez Valentin Gallery (Paris). Our channel screens a selection of works from the show HF/RG [ Harun Farocki & Rodney Graham] at Jeu de Paume in Paris every Monday.